Did a creepy mutant tear up your hunting camp and get photographed in the process? If so, then you might be able to get on the news. NBC 33 in Baton Rouge, Louisiana, likes to encourage its viewers to send in photos to its news crew that will possibly be aired on the station's morning and evening news shows. Usually, these types of photos are the typical cutesy images that one expects of community journalism. This photo, though, looks like something out of a low-budget horror movie and was shown on yesterday's news program. According to the news anchor, the image was sent in by a viewer who wanted to remain anonymous. 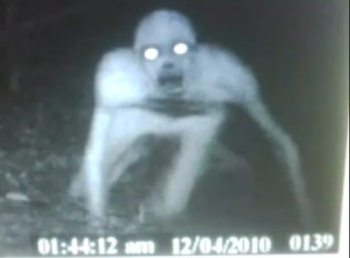 The guy claims that the photo was recovered at the site of a hunting camp owned by his friend's family; the camp itself had been torn apart, but the memory card (not a SIM card, like the anchor says) was apparently intact in the camera and contained the image of this creature. The video of the actual segment can be seen here, but there aren't any more photos on display and the accompanying commentary from both the anchors and the peanut gallery on the Web don't really add anything to the story. Viewers of the news station offered a number of online comments that were subsequently broadcast as part of the segment. Most of the folks seem to think the image is Photoshopped, which I can't say I disagree with. What about you? Do you think this is the beginning of a real-life horror movie, or did someone manage to fool some gullible journalists?